We’ve all done it. You wanted to know “Which ‘Game of Thrones’ Character” you are. I wanted to know which Beatle I was. We’ve both shared it. And before you knew it, it spread all over our newsfeeds. Facebook Quizzes are fun, engaging, and shareable. It’s also a great marketing tool. Read up on how you can use Facebook Quizzes to aid customer segmentation, along with a slew of other marketing benefits. By its very nature, Facebook Quizzes were designed to be engaging. Everyone knows that. But beneath the surface, it also presents a great opportunity to learn more about your audience, increase awareness, and even build your email list. When you’re able to capture your audience’s attention like quizzes are wont to do, all you need is to add a dash of creativity, and the marketing opportunities become infinite. 82 percent engaged with quizzes after seeing it on their newsfeed. According to BuzzSumo, an average quiz gets shared up to 1,900 times. You can come up with a high production value video, and you’ll find it hard to compete with that. But that’s just on average. One of the highest shared quizzes, ‘What color is your aura?’ had close to 4 million shares. 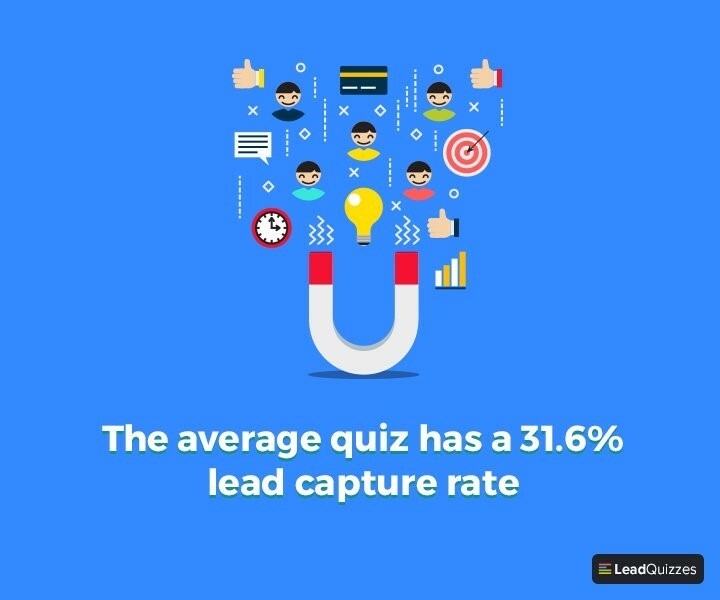 According to LeadQuizzes, the average quiz has a 31.6 percent lead capture rate. Facebook Quizzes are what’s called interactive content – one of the most engaging content there is. According to a CMI survey, 81 percent agree that interactive content grabs attention more effectively than static content. And because audiences are not just scrolling through the content but actively engaging in it, it’s more effective in relaying (and retaining) brand messaging, as well as with education and conversion. Because of its highly shareable nature, you’re able to reach even those that don’t follow you, giving you the opportunity to tap into new audiences. Apart from that, you can also get creative by mixing in valuable free content in exchange for their emails. With email continuing to enjoy the highest ROI among all other channels, everyone’s in the business of building their email list. Facebook Quizzes are a great and inexpensive way of doing that. This is tied in with the point above. People see a quiz they’re interested in (or maybe even see a number of friends sharing results), they engage with it, they share it. And it adds on to the pile of results on their network’s feeds. Every time it’s shared, your brand is shared. It’s tough to top that kind of exposure. When done right, Facebook Quizzes can engage audiences enough that it’s able to build an emotional connection. The laughs they shared with friends over a funny result, or the affirmation they get from it is play on people’s egos and emotions – and quizzes are excellent at providing these. The user may not have heard of you before the quiz, but after a favorable/humorous result, they’ll remember you for sure. 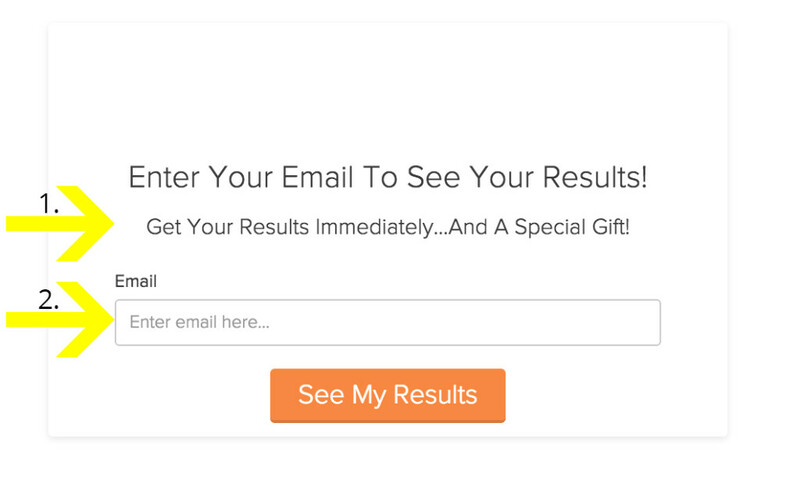 Post Planner brought to fore an example of how quizzes can generate sales leads. 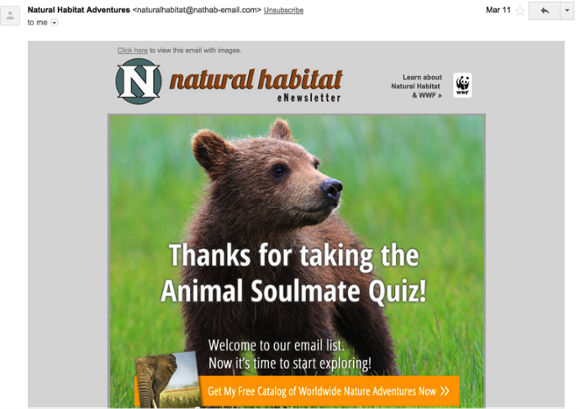 ‘Who’s Your Animal Soulmate?’ was a quiz brought by the partnership between the World Wildlife Fund and Natural Habitat Adventures. First off, who doesn’t like animals? And to entice you with an animal soulmate? Ultimate clickbait. It may not have the massive number of other quizzes (2,100 shares), but it acquired 1,043 emails. That’s better than 50 percent conversion rate. Even more impressive is the email sequence that followed. At the time, it was the most popular Facebook quiz with over 20.5 million views. It plays on people’s curiosity for what-ifs, which is always a great way to get people to engage. And by asking questions like how you take your coffee, favorite song, food, preferred hashtag, singer, and things of that nature – the quiz gets user information that would be useful for a plethora of marketing/customer segmentation purposes. This is a similar approach, but more realistic (as not everyone can just pack up and move to a new city). It also enjoyed a massive amount of views with over 18 million. And its questions are even more pointed towards customer segmentation. How would you spend your tax refund, what would you bring on an island, place you want to live in, picks on pop culture and various media—all of these can be directly used for marketing. They didn’t even have to veil it too much. There’s a whole gamut of quizzes like this one. It can be any trending show/movie/book – and it’ll more than likely get the click it wants because who wouldn’t want to be told they’re a Rachel? As well, there are pretty direct questions like favorite TV show (material for future quizzes? ), and activity on Fridays (definite marketing question). There are also those under the guise of psychology like asking for your favorite color, song, power, bird, season, among others. It could be any number of similar questions, but what this quiz does brilliantly is its use of questions that’s fairly easy to translate for customer segmentation purposes. Your preference of where you want your future children to be raised, mode of transportation, music to work, things to do on rest days, food you order at restaurants—these are all highly valuable data for targeting and segmentation. The quiz name itself is very eye catching. If you’ve got the time to spare, it’s easy to get curious if they could indeed guess what you do for a living. After that, it’s the same recipe as the previous four on this list – a list of questions about you and your preferences that basically lets you profile yourself for them. As you might imagine by now, once you identify a goal, you can accomplish a lot with a well-designed quiz. Of course, surrounding it with the necessary structure (boosting quiz, supporting email sequence, data analysis) is equally important for this strategy to work. What Facebook quiz do you remember enjoying the most? Sound off in the comments section. Aaron Chichioco is a digital PR/business columnist. He has vast experience in overseeing daily operations of several online businesses since 2011. He is currently employed with grit.ph. You can follow him on Twitter.